The earliest Grimshaw on record was Walter, who was living in about 1250 A.D. Walter was the progenitor of most, if not all, Grimshaw lines that have survived into the present. Walter’s line of Grimshaws apparently started in Eccleshill, southeast of Blackburn, and subsequently moved to Clayton-le-Moors, northeast of Blackburn. 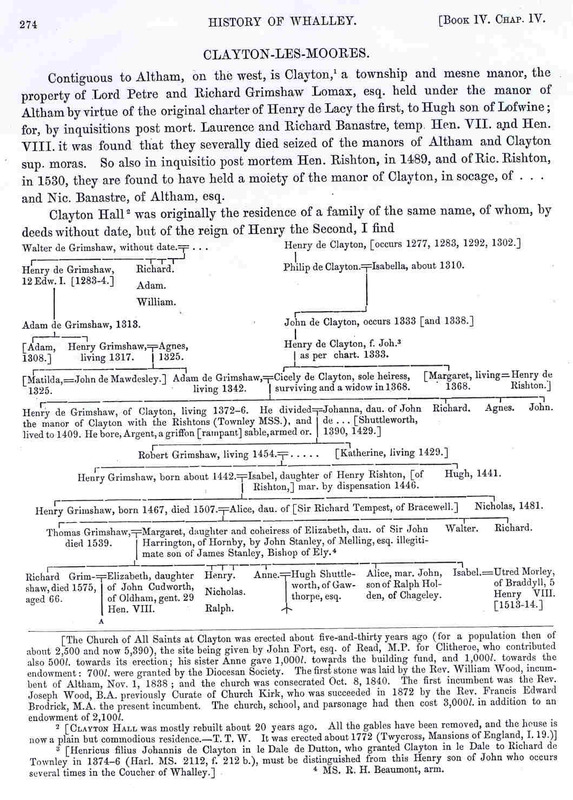 The descendant chart of Walter’s family is included in one of the first, and most important, published works on early Grimshaw families — “The History of Whalley” by Thomas Dunham Whitaker1. This descendant chart (v. II, p. 274-275) is shown below. Walter’s family is closely associated with the Grimshawlocation in Eccleshill. It is not known if Walter was the first Grimshaw at the location or if he was derived from a family already there. If the Grimshaw family was in existence at the time of the Norman invasion in 1066, the first Grimshaw on record in 1250 was derived from a family already 200 years old. It appears that the fortunes of the Grimshaws improved in 1345-47, when Adam, the fifth generation on record (after Walter), married Cecily Clayton, daughter and co-heiress of Henry de Clayton, whose family owned the Clayton-le-Moors estate. The family relocated to Clayton Hall after the marriage. Cecily was co-heiress with her sister, Alice. Adams son, Henry, divided the Clayton-le-Moors estate with Henry de Rishton and his wife, Margaret, who was the daughter of Cecily’s sister, Alice. The Grimshaws continued to reside at Clayton Hall, and the Rishton part of the estate was later centered at Dunkenhalgh. Apparently, the Grimshaws also kept their holdings in Eccleshill. Dunkenhalgh is now operated as a hotel in the southwest part of Clayton-le-Moors (see the map on another web page). Beginning with Adam, a total of 11 generations of Grimshaws lived at Clayton-le-Moors before the male heirs ran out. Rebecca Heywood, daughter of Mary Anne Grimshaw and John Heywood, married Richard Lomax in 1715 and Clayton-le-Moors passed into the Lomax Family after 370 years in the Grimshaw family. From Walter Grimshaw through Mary Anne Grimshaw Heywood, about 65 descendants were born, of which about 43 were male. Although not all had families due to early death and other reasons, there were probably at least 30 to 35 potential “lines of Grimshaws” to spring from this original branch. The Grimshaw family started by Walter, and having its location in Eccleshill, may actually have its roots at Grimsargh, which is located 10 miles northwest of Blackburn (and about four miles northeast of Preston). Stuart Grimshaw and Steven Grimshaw, local Grimshaw researchers in Blackburn and Preston, share this opinion. The potential pre-1250 connections (or origins) of the Grimshaws at Eccleshill to Grimsargh are currently an exciting area of Grimshaw research. 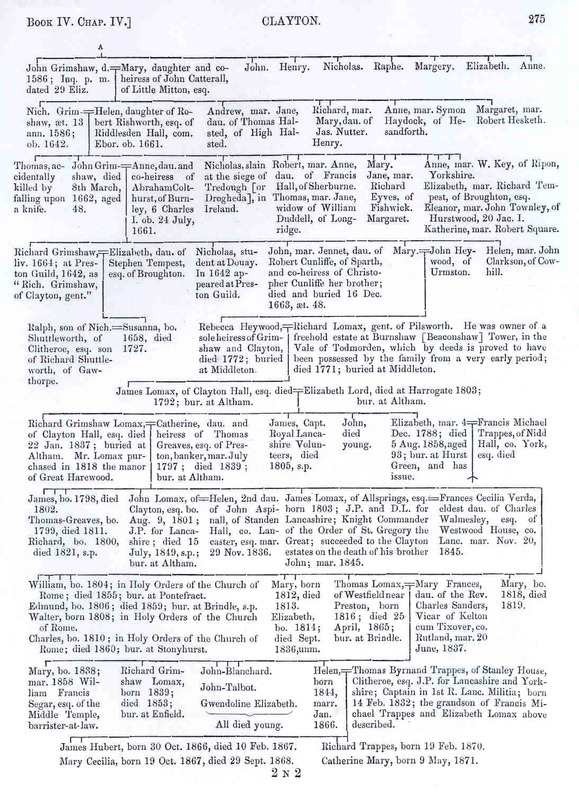 Shown below are the two relevant pages from Whitaker1 (v. II, p. 274-275) on the earliest Grimshaw family. The small letter “A” at the bottom of the first figure and at the top of the second figure show the point of connection of the two charts. The information on Whitaker’s charts above, when distilled down and put in conventional cascading descendant chart form, appears as shown below. The end of the Grimshaw line at Clayton-le-Moors was at the 15th generation, when Mary Grimshaw married John Heywood and their daughter Rebecca married Richard Lomax and carried Clayton-le-Moors into the Lomax family. Richard Trappes-Lomax authored a small book, published by the Chetham Society in 1926, that is one of the most important sources of information available for the earliest recorded Grimshaw family line (see companion webpage). “A History of the Township and Manor of Clayton-le-Moors, Co. Lancaster”5 provides abundant information on the Grimshaw family that originated in Eccleshill and occupied the Clayton-le-Moors estate for over 400 years, until the Grimshaw line ran out and the estate was carried into the Lomax family. The book also contains valuable information on a contemporary Grimshaw line, located at nearby Oakenshaw, that stemmed from the Clayton-le-Moors line. A similar connection to the junior Pendle Forest Grimshaw Family line (see companion webpage) can also be made, although not as definitively. The evidence is taken from articles published in 1877 The Preston Guardian, the principal newspaper of Preston during that time, which published a series of four lengthy articles on the Pendle Forest Grimshaws. These articles provide a great deal of highly relevant Grimshaw family history and are provided on a companion webpage. They are best reviewed in conjunction with Whitaker’s descendant chart shown above. Two of the articles published in The Preston Guardian in 1877 provide information that indicate (but do not definitively demonstrate) the connection of the more junior Pendle Forest line of Grimshaws to the earlier Clayton-le-Moors line. The relevant portions of the two articles are shown below, with the most significant parts underlined. An interpretation of the most likely connection of the Pendle Forest Grimshaw line to the earlier Clayton-le-Moors Line is then presented. Interpretation: How Is the Pendle Forest Line Connected to the Clayton-le-Moors Line? We have not been able to ascertain positively the link of connection with, or the point of detachment from, the Grimshaws of Clayton Hall, of the Grimshaws of Pendle Forest, albeit the fact of the common ancestry may be safely taken for granted. We think it most likely that Nicholas Grimshaw, living in 1481 (younger brother of Henry Grimshaw, of Clayton Hall, who died in 1507) was progenitor of the Pendle Forest Grimshaws; this surmise is chiefly based upon the circumstance that “Nicholas” appears to have been a favourite Christian name in this family in every successive generation from the reign of Elizabeth to the present time. The first member with which a careful pedigree of Grimshaw of Pendle Forest, inserted in the new edition of Whitaker’s “History of Whalley,” commences, is Nicholas Grimshaw, living in 1593. But we have met with references to Grimshaws resident in Pendle Forest more than half a century prior to that date. These we note below before proceeding to show the descent of the Preston Grimshaws from Nicholas Grimshaw last-named. Richard Grimshaw, of Moor Hills, also described as of New House in Pendle Forest, who is first met with as above in the year 1554 and was evidently either son or brother of George Grimshaw, occurs at several dates in the 54 years between the first allusion and the date of his death in 1608. Besides the copyhold of Moor Hills, which he had no doubt in succession to George Grimshaw, Richard Grimshaw acquired in conjunction with Nicholas Halsted, a freehold in Twiston, near Downham, by conveyance from Richard Asheton, Esq., lord of Downham. It was shown in our first paper on the Grimshaws, that Richard Grimshaw, gent., of New House and Moor Hills in Pendle Forest, who died in 1608, left no male issue. The descent of the modern family of Grimshaws, a branch of which was established in Preston, is traced down from Nicholas Grimshaw of Heyhouses, in Pendle Forest, who was living in 1584. There can be no question that Nicholas Grimshaw of Heyhouses, and Richard Grimshaw of New House, were near kinsmen; I conjecture they were brothers, although there is no direct proof on that point. The tenements they held in copyhold were contiguous, and they were contemporaries,  Nicholas Grimshaw, however, died several years earlier than Richard Grimshaw. Heyhouses, where these Grimshaws were seated for several generations, is an ancient hamlet in the heart of Pendle Forest, at the base of Padiham Heights on the north side, and closely adjoining the old hamlet of Sabden (which has been robbed of its name and significance by the comparatively modern manufacturing village of Sabden Bridge, lower down the glen). Four hundred years ago this hamlet of Heyhouses was founded, for it is recorded that certain charterers of the Forest, appealing to the commissioners of Edward IV., accused “Ric. Radclyffe, squyer, for making a town upon a tenement called ye Heyhouses, where he had no right without the Kynges staff.” Nicholas Grimshaw of Heyhouses had a son and heir, Thomas Grimshaw, to whose use , in the 36th Elizabeth, he surrendered his copyhold estate. The date of Nicholas Grimshaws death has not been stated. C. Interpretation: How Is the Pendle Forest Line Connected to the Clayton-le-Moors Line? Nicholas, living 1481 (9th generation descendant of Walter Grimshaw shown on the Clayton-le-Moors descendant chart) was probably the father of George Grimshaw. George was either the father or brother of Richard Grimshaw — most likely the father as indicated by the suit between Ann, George’s wife, and her (indicated) son, Richard. And Richard was the brother of the Nicholas (living in 1593) at the top of the Pendle Forest descendant chart. The 1593 Nicholas at the head of the Pendle Forest Line is thus either the grandson or great-grandson of the 1481 Nicholas shown in the Clayton-le-Moors line, depending on whether George was the father or brother of Richard. Richard, in turn, was probably the brother of the Pendle Forest Nicholas. |–|–|–|–|–|–|–|–9 Nicholas Grimshaw (shown as “1481” in Whitaker chart above). |–|–|–|–|–|–|–|–|–|–11 Nicholas Grimshaw (head of Pendle Forest line on companion page). Ann Grimshaw, 11th generation descendant of Walter Grimshaw, married Hugh Shuttleworth and the couple initiated the prominent Shuttleworth family line at Gawthorpe Hall, as described on a companion webpage. Ann Grimshaw was the fifth child of Thomas and Margaret (Harrington) Grimshaw of Clayton Hall. She married Hugh Shuttleworth of Gawthorpe, located about four miles northeast of Clayton Hall, in 1540. The descendants of Hugh and Ann (Grimshaw) Shuttleworth comprise one of the more distinguished family lines of Lancashire. Gawthorpe Hall, a significant historical landmark in the region, was built by the sons of Hugh and Anne between 1600 and 1604. 2Raines, F.R., ed., 1870, The visitation of the County Palatine of Lancaster, made in the year 1567, by William Flower, Norroy King of Arms: Chetham Society, Old Series (First Series), v. 81. 3Raines, F.R., ed., 1871, The visitation of the County Palatine of Lancaster, made in the year 1613, by Sir Richard St. George, Norroy King of Arms: Chetham Society, Old Series (First Series), v. 82. 4Raines, F.R., ed., 1872-1873, The visitation of the County Palatine of Lancaster, made in the year 1664-5, by Sir William Dugdale, Knight, Norroy King of Arms: Chetham Society, Old Series (First Series), v. 84, 85, 88. 5Trappes-Lomax, Richard, 1926, A History of the Township and Manor of Clayton-le-Moors, Co. Lancaster: Chetham Society, New (Second) Series, Volume 85, 175 p.
In about 2001, Christopher Telfer prepared a consolidated descendant chart from a number of sources, including (as a minimum) the Eccleshill/Clayton-le-Moors line, the Oakenshaw line, the Pendle Forest line, the Irish line and his own ancestor investigations. The results of Christopher’s efforts are presented below (without verification).